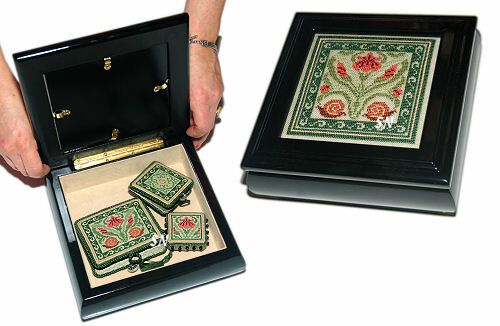 Quality wooden products we love to use to mount needlework... Candle Screens and Pin Cushions are some of our favorites! A lovely set of Iris to decorate a box top (Sudberry House Flat Jewelry Box) or the tiny pin keep, scissor case, and needle book set. Offered as charts, the box top is worked on 30ct Weeks Tin Roof linen, while the set of smaller pieces (available in the accoutrement package of charts) is worked on 40ct. Coded for silks or DMC, the colors are sage, rusty orange, and brown-rose. Regular cross stitches, with a Herringbone Lacing Stitch used to assemble the small pieces... clear charts, piece placement guides, and lots of finishing tips! This box is lovely -- measures approx 8 x 8 with a 5-1/2 inch recessed design opening in the top. It stands just 1-1/2 inches high, and opens to reveal a green velveteen lining on the top and bottom. Oh, this is so cute!! It matches the main JB Halloween Sampler... but has only happy motifs on it! (No skulls or 'rottin' bones!!!) 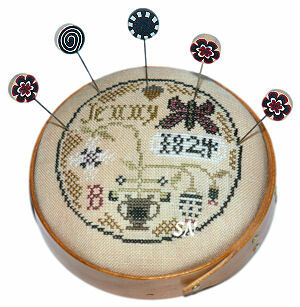 A butterfly and floral urn, it's stitched on 40ct, but I believe 32 will still fit the Sudberry House Shaker Pin Cushion. This little piece is great for so many different projects!!! Measuring 3-3/4 inches in diameter -- it'll hold a design that size on top. A pretty Shaker, the padded top is included with the wooden base. Made in the USA as abn historic water-powered mill!